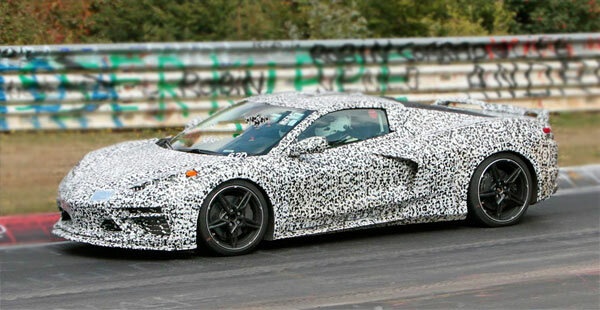 Will The New Corvette C8 Be a Supercar? The long-standing Chevrolet Corvette is getting a major shakeup in the new edition with a mid-engine setup and a new design which is looking more Italian or supercar than the traditional American lines of current models. Due to debut this summer, possibly at the National Corvette Museum, the new ‘Vette is definitely going to be a major talking point with a new look and mid-engine design, but will new and existing customers go for the new concept and is the C8 ‘Vette going for super car territory? As a brief rundown, here’s what we know up to now. Pricing could be around $60,000 to $70,000. Engine speculations point to a new version of the LT1 6.2-liter V8 with around 500 horses, possibly a twin turbo flat-plane crankshaft version(up to 800hp) and even a hybrid version for base models. A Dual-Clutch only transmission is also a possibility, with racing versions also being made. Spy shots have been a plenty giving more of an idea of what’s to come externally, but with a history going back to 1953 as ‘America’s Sports Car’ and rearwheel drive all the way, the next ‘Vette is a bold move. However, a mid-engined version has been on the back burner since 1970 and reports online say the front engined, rear-wheel-drive setup had reached its grip limit back in 2004. We are still in the speculation bubble of the car’s development, but one things for sure, it’s not going to be an upgraded ZR1. The ZR1 is arguably the best Corvette produced when it comes to performance, handling and luxuries, so where do you go when you have built your ultimate version? On one side, a supercar ‘Vette makes sense if Chevrolet have taken the current design to its limits. As V8s become more niche and more power and performance is expected, it makes sense to opt for the supercar club. It’s just that the expected pricetag is in regular sports car territory rather than the exclusive money doesn’t matter category. If a supercar it wants to be, a supercar it should be with 1,000Hp hybrid engine, ridiculous features and a pricetag to match. On the other hand, the Chevrolet Corvette has a long, rich history based on some tried and tested formulas. Go too far off the beaten track and the car is in danger of alienating existing fans, but on the flip side, attracting those who would never consider a ‘Vette in the past. It’s a bit like a band trying out a completely new sound on their next album. Some will get it, some will not. Pleasing the existing fan base while attracting the new, while trying to innovate at the same time is a tricky juggling act at best. No matter how the C8 turns out, a supercar version of what we have now or a completely new generation remains to be seen, but the present model is still one of the best sports cars out there, supercar label or not.